Inspired by Halloween and featuring all manner of ghosts, ghouls and goblins, Halloween Fortune is a five reel, three row and 20 payline slot game with an impressively high theoretical return to player percentage of 97.06%. Boasting images, graphics and features based upon all of the recognisable characters and creatures associated with All Hallows Eve, the slot includes a Jack O’ Lantern wild symbol and a Witches’ Brew bonus amongst its elements. 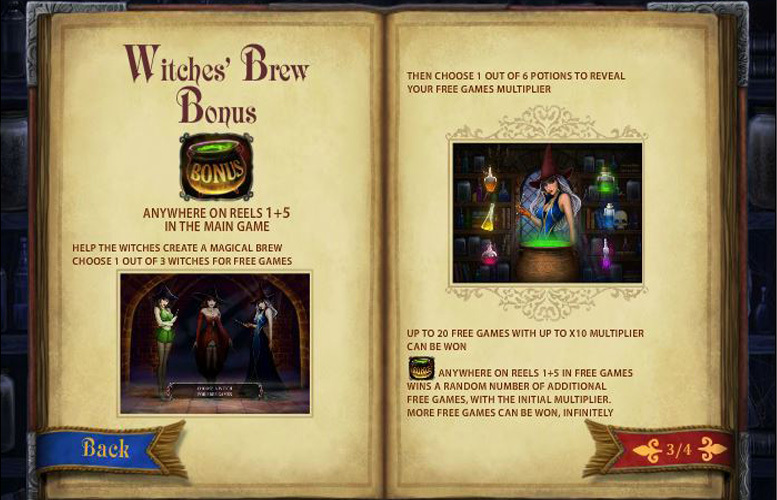 The slot’s Witches’ Brew bonus game adds extra interest to gameplay and gives players the chance to trigger up to 20 free spins with an up to 10x multiplier. Wild substitutions and scatter wins introduce different ways for players to win big. 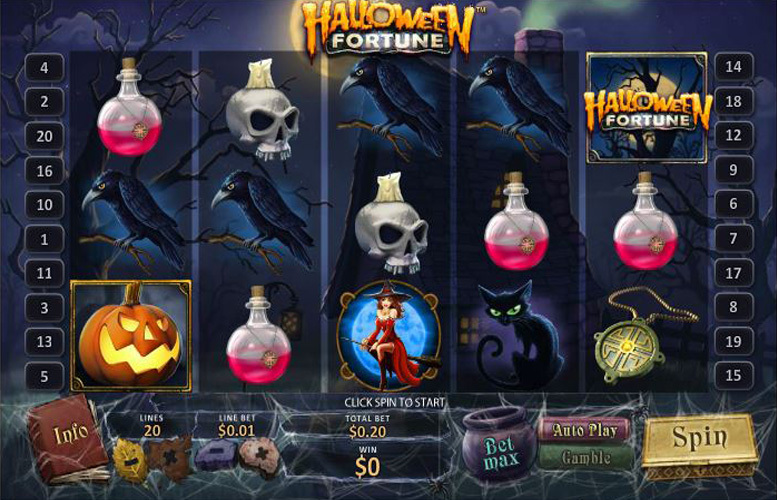 Features like the bonus game, wild symbols and scatters give Halloween Fortune its impressively high 97.06% theoretical return to player percentage. Viewed separately from the slot’s free spins and bonus features, Halloween Fortune’s actually payline jackpots are a little on the stingy side. Line bet options are comparatively limited, meaning that players can only bet between 1p and £20 per spin. It is if five matching symbols line up consecutively from left to right along one of Halloween Fortune’s active paylines that players will win the highest jackpots. The top jackpot of all is triggered when the five symbols in question are the game’s Jack O’ Lantern wild symbol. Five of those Jack O’ Lantern wilds in the correct combination will return to the lucky player a jackpot worth fully 10,000 times the line bet they chose for the spin. The highest level which the line bet can be set at is £1, so the value of the slot’s top payline jackpot is a nice if not magnificent £10,000. In order to add some extra fun to the slot’s gameplay and to give players a bit of treat, Halloween Fortune includes a handful of additional game features. These include wild substitutions, scatter wins and a Witches’ Brew bonus round which can trigger loads of really beneficial free spins. We’ve already explained how Halloween Fortune’s Jack O’ Lantern symbol can make up the game’s most valuable payline combination but it also works as a traditional wild. That means that when it appears on the reels, it can substitute for any regular symbol in order to make up the highest paying combination possible. The Halloween Fortune scatter symbol is perhaps one of the most welcome sights for any player when it appears on the reels. Whenever three, four or five of them appear at once, after all, the player receives an instant win worth five, ten or 50 times their total bet, respectively. That’s right, the total bet, not just the line bet. 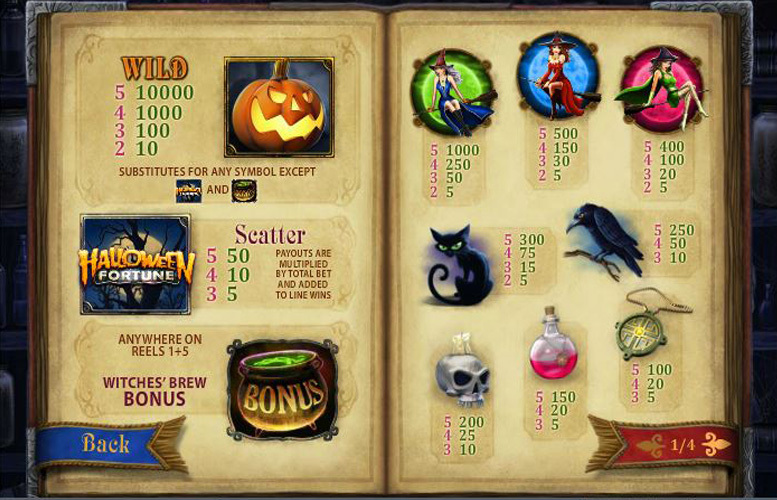 If the witches’ cauldron bonus symbol appears on reel one and reel five after a Halloween Fortune spin, the slot’s Witches’ Brew bonus is triggered. In that bonus round, players must select one of three witches and one of six potions in order to determine first how many free spins they receive and then the size of the multiplier attached to them. The maximum number of free spins available stands at 20 and the highest possible multiplier is 10x. Skulls, ravens, witches and all manner of other traditional Halloween themed images feature on the regular symbols which appear on the Halloween Fortune reels. 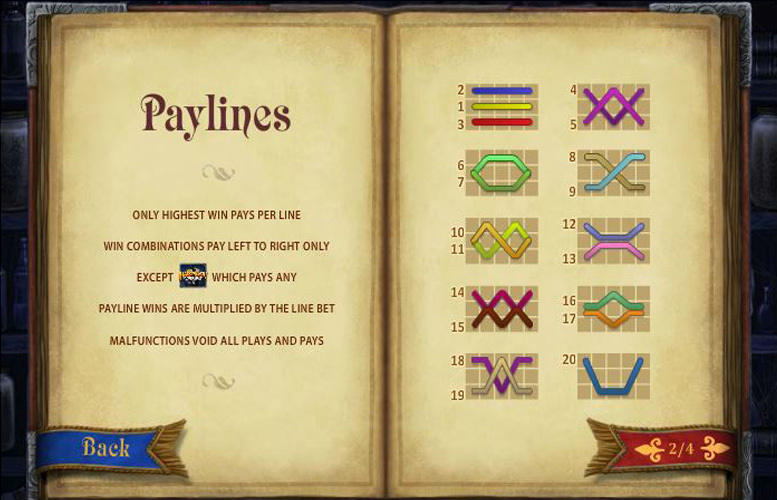 Those regular symbols can all go toward delivering payline jackpots if they align in combination along the slot’s active paylines. The best jackpots result when five matching symbols appear on a payline, and the most valuable regular symbols are those depicting witches against different coloured backgrounds. Five of the green background witches trigger a jackpot worth 1000 times the line bet, whilst five of the blue or pink background witches result in payouts of 500 and 400 times the line bet respectively. The range of available bets per spin for Halloween Fortune players is unfortunately a little limited. The minimum possible total bet stands at 1p, as is the case for many slots, but the maximum is only £20. In order to alter the amount they wish to wager, players can alter either the number of active paylines or the amount they bet per payline. The slot features a maximum of 20 paylines and anywhere from just one to that maximum of 20 can be active for any one spin. Line bet options, meanwhile, range from a minimum of 1p to a maximum of £1. Perhaps best enjoyed in the autumn or at least sometime close to Halloween itself, Halloween Fortune is plenty fun enough to be a good slot game choice all year round. The slot, after all, boasts an excellent theoretical return to player percentage and a good number of fun gameplay features. Those features include generous scatter wins and a bonus round which can deliver up to 20 free spins with a potential 10x multiplier. It is those enhancements, then, which help to boost the slot’s winning potential as well as making gameplay more immersive. Halloween Fortune’s payline jackpots, however, are unquestionably a little disappointing with a top payout of £10,000 comparing poorly with jackpots offered by other slots. The slot’s range of available staking alternatives, too, is a little more limited than many players would prefer. This game has a rating of 4 / 5 with 213 total reviews by the users.